Have you ever seen a hoodoo? These odd shaped rock spires are the result of eons of erosion and nowhere do you see greater concentrations of them than Bryce Canyon National Park. Bryce Canyon is a little gem sitting about 80 miles northeast of Zion National Park and 150 miles north of the north rim of the Grand Canyon. Driving to Bryce Canyon from Salt Lake City takes about four hours and from Flagstaff about five hours. 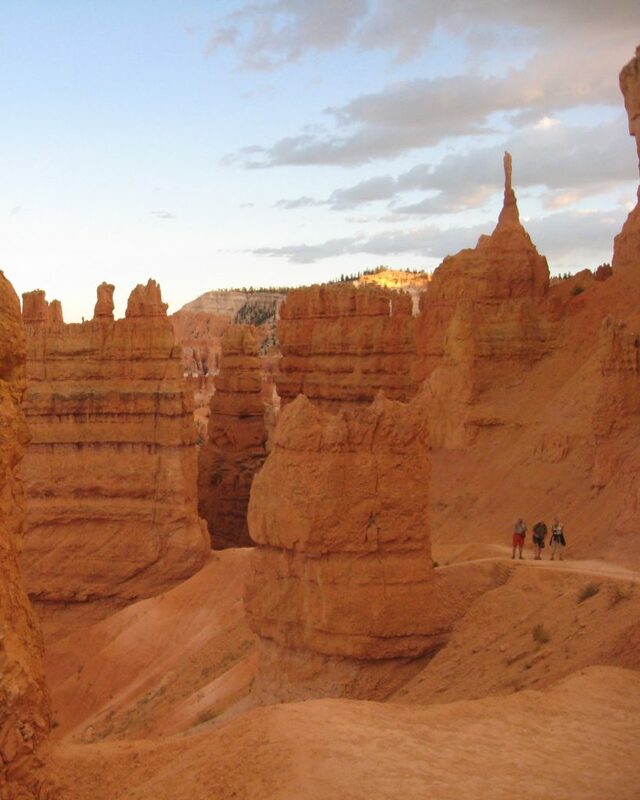 Since this area of the country has a huge concentration of national parks and recreation areas, you may wish to plan your visit to Bryce Canyon in conjunction with a visit to one or more other parks. Bryce Canyon is open year-round. The park itself is open twenty-four hours a day, but the visitor center has variable hours depending on the season and is closed on Thanksgiving Day and Christmas Day. Sixty percent of its visitors come in summer, between June and September, but the park service encourages visitors to consider coming in the off-season. Fall and spring can offer beautiful foliage and wildflower displays, and winter snows offer an entirely different background for the park’s formations. Daily high temperatures average from the 40s in winter to the 80s in summer. Overnight lows average from the teens in winter to the 40s in summer. Snow accumulation can close roads in winter, so it is wise to be aware of weather conditions before you get underway. The drivable portion of the park is a thirty-eight mile round trip scenic road, running mainly north and south, with thirteen observation points along the way. 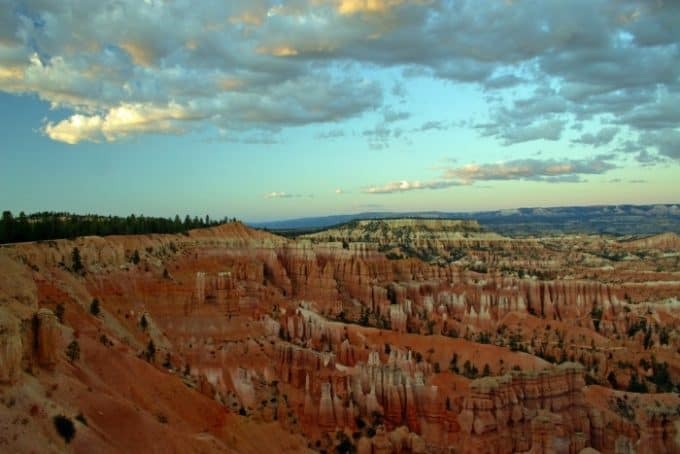 The road follows the edge of the Paunsaugunt Plateau, and all the rock formations that people recognize as Bryce Canyon are below the eastern rim of the plateau. The park operates shuttle buses that leave at regular intervals from the visitor center and travel the entire route. The shuttle is not mandatory, but park officials hope that many visitors will take advantage of the shuttle to minimize congestion and pollution in the park. The road along the plateau is at an elevation between 8,000 and 9,000 feet above sea level. Persons with heart or respiratory problems should take care not to overexert themselves at this altitude. Even a healthy person who is accustomed to living at sea level may huff and puff a bit at this elevation. Remember your sunscreen and a hat. Even though the temperature may be cool and pleasant, the sun is stronger at higher elevations and it’s easy to get a sunburn without realizing it. If you want to get up close and personal with the formations, you can take a hike. There are a variety of day hikes from one mile to several miles long and rated easy, moderate, or strenuous, depending on the grade (incline) and how much the elevation changes. Most hikes go downhill from the rim and circle around and return uphill to the rim. There are incredible views on these hikes that you can’t see from the road, so, if you’re up to it, plan some hiking into your schedule. Backcountry hiking is also available, but camping in the backcountry is only permitted in designated sites, and you must have a permit. Permits can be secured from the visitor center up to 48 hours before you hike, but only in person. You cannot get a permit by phone or internet. Stargazing is another popular option. The sky at Bryce Canyon is so dark that, when it’s clear, you can see as many as 7,500 stars on a moonless night. The park offers regular programs including a multimedia show followed by telescope viewing. When the moon is full, the park offers ranger-guided full moon hikes. Check the schedule at the visitor center to see what other ranger programs are offered on any particular day. There are hikes, lectures, video and slide presentations, and programs, especially for kids. Many of the photographs you see of Bryce Canyon were taken either at sunrise or sunset. The shallow angle of the sun at these times adds extra color to the formations and results in some stunning pictures. Probably the most photographed area is the Bryce amphitheater which is viewed from Bryce Point. A variety of lodging options is available. The Bryce Canyon Lodge within the park has 114 rooms, and there are a half dozen other hotels within a few miles of the park entrance. There are two campgrounds within the park which have flush toilets and drinking water, but no hook-ups. Laundry and shower facilities are available during the summer months. There are also private campgrounds just outside the park entrance, some with full hook-ups and a number of other amenities. There are several restaurants just outside the park, and a couple stores selling groceries and other supplies for campers. If you have only a limited amount of time, allow yourself at least half a day to drive the scenic road or take the shuttle and stop at all the observation points. The views are spectacular and unique to this park. If you have time, take a short hike or enjoy a ranger program. If you have two days with an overnight stay, plan to drive the scenic road on the first day. Be at one of the observation points from about one and a half hours before sunset to see some amazing colors. Perhaps you can catch a stargazing program in the evening. The next morning, get up before sunrise and go to one of the observation points to see the formations in all their glory. Go back and have breakfast and then take a hike and enjoy the scenery around you or participate in a ranger program. Whatever time frame you choose, you will have the opportunity to see one of the most unusual natural spectacles in the world.